The New year started with new beginnings and resolutions.After releasing the first two editions of the “STAR” TISTS” magazine “The Contemporary Women’s Art Magazine”, I proudly present to you the first paperback quarterly version.The journey has been exciting so far along with the dedicated and hardworking artists and readers.This issue features some of the world’s best artists, their interviews, and paintings.All the artists are extraordinarily creatively skilled and their brilliance shines through all the pages of this magazine. “STAR” TISTS” aims to know the mind and heart of the artists.It sincerely focusses on bringing the artists to the limelight and let their art reach the world. Hope this edition of “STAR”TISTS” inspires you and makes you travel through the artist’s lives and dreams.It motivates you to create more and lights up the artistic soul. Priya Yabaluri is a leading contemporary artist from Mumbai, India.She has many groups and solo art shows to her credit.A member of Art Society of India, she also has curated Art shows.She is presently into creating awareness of Art through her Marketing brand "Art For Awareness" helping others artists, encouraging them and promote their art in the society. A painter by day and a writer by night.She is also a poet and recently launched International Women's Art Magazine "STAR"TISTS"
She says, "we have a lot of talent around the world.Often the artists keep up a low profile.People see the paintings but they hardly know the artists who put so much effort and love in their works. I launched this magazine to bring Women Artists into the limelight and Exclusively Interview them So that the readers fall in love with each artist's work and their heart and soul behind." 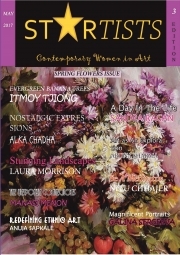 "STAR"TISTS" is the first International Women's Art magazine launched in India. A very innovative and beautiful Magazine for the art lovers and readers.Beautiful artists and Stunning talent .Great to know about them and learn more about the artist's profile!